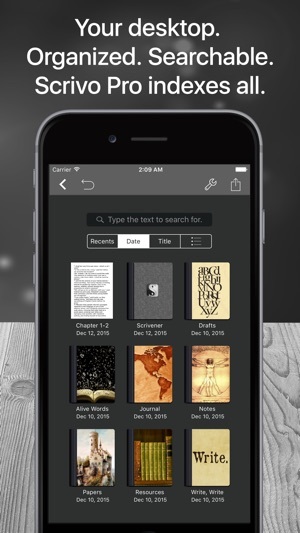 App featured by Apple on the "Best apps for writers" collection! You have a story to tell, article to publish, class notes to take, whether it’s today’s journal entry, tomorrow’s thesis or a future bestseller novella. Scrivo Pro can help you organize your writing, research, generate ideas, and remove distractions so you can focus on the most important thing: writing. 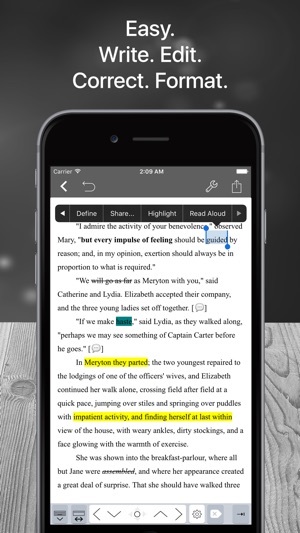 Scrivo Pro is more than an innovative, fast and reliable writing app designed for anyone who writes. 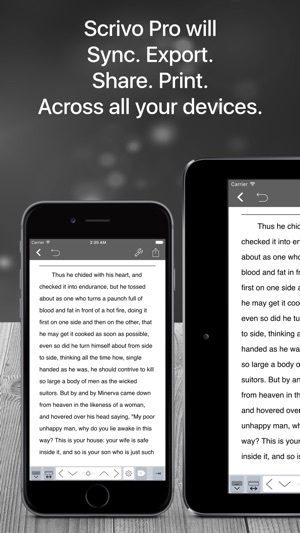 This is a writing workspace for your iOS devices and a great Scrivener and Ulysses companion on your Mac or Windows computer. 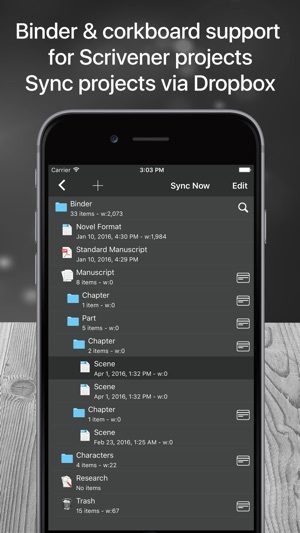 If you are a Scrivener 2 or Scrivener 3 user on your computer, Scrivo Pro will open your projects (binder and cork-board with index cards) and seamlessly sync them via iCloud or Dropbox. · Insert special symbols arrows, parentheses, maths, bullets/stars, GPS location, etc. · Create projects in a tree-like structure: Sections, Drafts, Folders, Chapters, Research, etc. · Full PDF reader and manager included for reference files, ebooks, articles, resources, papers, etc. · Export, share and print your documents to multiple formats like RTF, Markdown, PDF, ePub, HTML, RTFD, TXT etc. Scrivo Pro 4.5.8 - Added new Settings option to the app menu (gear icon) to change the User Interface color theme (Dark, Light, Sky, Black, Olive, etc.). You can also disable automatic backups, change the Text-To-Speech voice rate, disable auto-lock screen. Love the app. I have also had the occasional graphics glitches on my new iPad Pro (gen 3). It looks like scrambled boxes that covers some text. The issue seems to come up when I open files synced with iCloud. Haven’t experienced it with files prior to syncing. The glitch goes away by itself eventually; only a minor annoyance. The app is still worth the money though. I like it but on m iPad 12.9 it creates these weird squares randomly over the text. I have to close the file and reopen to clear them. Sometimes that doesn’t work. I’ve contacted them twice about it, sending them screenshots. They responded once, but through every update the problem remains. Hello! We tried to reproduce this issue without success on our side. No other users are reporting it but we will continue doing more tests! I can’t even open a project without the app completely crashing. Disappointed I spent money on this app. The concept is great but they need to fine tune the issues and glitches. Hello! Thanks for your message. Did you send your issue to our contact email? contact @studio5apps.com, please, resend again if you are not sure and we will help you!